Are Pro Days really all that important? There was much hand wringing earlier this week in certain quarters about the fact that no one from the Cleveland Browns coaching staff has been in attendance for the Pro Days of quarterbacks Teddy Bridgewater and Blake Bortles. Apparently it wasn’t enough that general manager Ray Farmer and the team’s scouts were in attendance as Bridgewater had a disappointing effort while Bortles fared much better. No, the fact that head coach Mike Pettine, offensive coordinator Kyle Shanahan and quarterbacks coach Dowell Loggains were not there is just another sign of the Browns dysfunctional ways. The whole manufactured controversy got us wondering just how important a player’s Pro Day really is in today’s NFL. The quarterback? That would be Brandon Weeden. That was former Oakland head coach Lane Kiffin after watching JaMarcus Russell at his Pro Day. We have one more, Browns fans. The speaker? None other than former Browns head coach Romeo Crennel. The quarterback? Brady Quinn. Which led to this happening a few months later. Clearly, having a coach attend a Pro Day does not guarantee that the right call will be made on draft day. But that is all it is: a piece of the puzzle, not the entire thing. The days of a team using the back pages of a Street & Smith’s to select a player are long gone. Teams have multiple hours of game tape to watch and can conduct private workouts with draft prospects, as well as bring them to town for interviews and physicals. Which is what the Browns are reportedly planning to do with all the top draft prospects. Think about it: where are the Browns most likely to find the most information about a quarterback? At a manufactured event like a Pro Day, where every throw and drill is scripted to maximize what a player does best? Or in one-on-one interviews where they can talk openly with a player, study film and really dig deep into how the player thinks? And what is the best thing that Pettine, Shanahan and Loggains can be doing right now, studying game tape in Berea to try and figure out how to get this thing turned around, or standing in a fieldhouse somewhere watching a player in shorts and a T-shirt throwing a football? 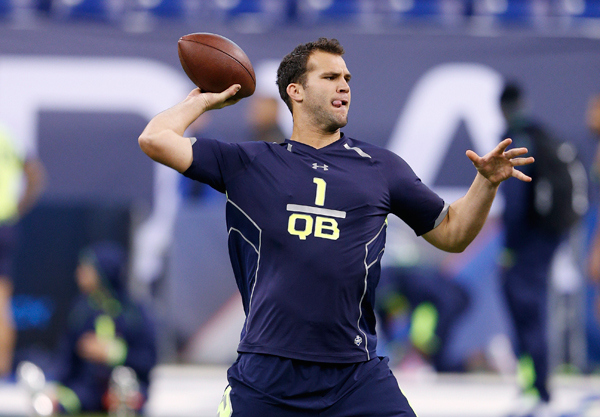 The Browns certainly have a dubious history when it comes to drafting quarterbacks. And there is no telling how things will work out in May if they decide to select a quarterback. But one thing is certain. The success of any future quarterback on the Browns roster will have no correlation to who was in attendance at a Pro Day. pro day was important for joe haden. while i notice you found a couple examples of players with good pro days doing badly, can you think of players who tanked their comfy security blanket home-catwalk beauty pageant who went on and succeeded? because i can’t. not for nothing but if pro days would be a lot less important if prima donna agent-operated ‘talents’ remembered that they are firstly football players and when a coach wants 20 push-ups –or for him to take a 7 step drop and throw 30 yards downfield outside the numbers– he promptly does it. let put it this way: do you want the browns to draft bridgewater more after his pro day performance or less after his pro day performance? I think what was so surprising about Bridgewater and his Pro Day is it seems like no one ever does poorly, but he somehow managed to pull that off. I’ve always been a bit neutral on Bridgewater and the Browns, so his performance didn’t really sway me one direction or the other. I’m not really sure I wanted the Browns to draft him in the first place, so if a bad performance this week confirmed for the team that Bridgewater is not their guy, I’m OK with that. I’ve come across the POV expressed in this article via a number of former NFL people in various media formats. Still, the vast majority of both national and local media folk parrot the narrative that Browns-dysfunctional-‘cause-they-not-follow-script-we-know. How is this possible that the likes of Grossi, Cabot et al. can make a career of burying their heads in the sand and yet the masses return again and again to hear what they have to say? Sorry, no real point; just venting as a metaphorical banging of my head against a wall to replace the actual momentarily. I had a similar conversation a couple of years ago with Cleveland Frowns. At the time I thought it didn’t matter as much what the team’s beat writers put out there because not everyone reads them. But Frowns pointed out that because the majority read them, they still drive the stories far too much. As to why they are not better … I don’t know. I guess there is no real incentive to improve so after so many years on the beat why bother? It’s like Grossi’s aversion to watching film on players. You cover the NFL and from the end of the season until the draft there are no games to cover, so why would you not try to learn as much as you can about prospective players? Find someone who knows what they are doing to help you break down and interpret the tape and give us some real info. To answer your question more succinctly: I don’t know. Some questions have no answer. cuz hes lazy. It’s a lot easier to write a negative story and pump it on twitter than to do actual research and bring insights into the game.